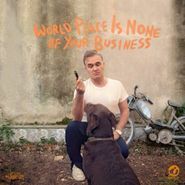 World Peace Is None of Your Business might be Moz’s angriest album yet. Full of bitter political cynicism and social commentary, the album has the feel of a knowing screed by someone who’s seen it all and whose attitude mostly feels justified. Whether he’s detailing the death of a beat poet (“Neal Cassady Drop Dead’s” “everyone has babies, babies full of rabies” line is priceless) or bemoaning the futility of human connection (“you fail as a woman and you lose as a man” he sings in “Earth Is the Loneliest Planet”), Morrissey’s in classic sardonic mode, while musically the band lays on touches of flamenco guitar, a digitized beat here and a harp there, to form a more lush version of the hard-hitting rock sound he’s employed for the latter half of his career. Not all of Morrissey’s lyrical gambits work—the title tracks’s frustration is understood, but its “each time you vote you support the process” seems insensitive to the places and people that have fought long and hard for this right. Still, it’s hard to resist when he’s in his finest form, on tracks like the extended “I’m Not a Man,” in which Morrissey places his militant vegetarianism and pacificism front-and-center as a new form of manhood, reminiscent of his classic line “it takes strength to be gentle and kind,” (from The Smiths’ “I Know It’s Over”) amid glittering synthesizers and glam stomp. For anyone who’s unfairly labeled Morrissey a miserablist in the past, World Peace shows Moz as an elder statesman with his fists clenched and plenty of piss ‘n’ vinegar left in his system.